The videos you see here were produced by the students in an upper-level seminar on the History of Vancouver, offered by Simon Fraser University’s Department of History in the Fall of 2016. 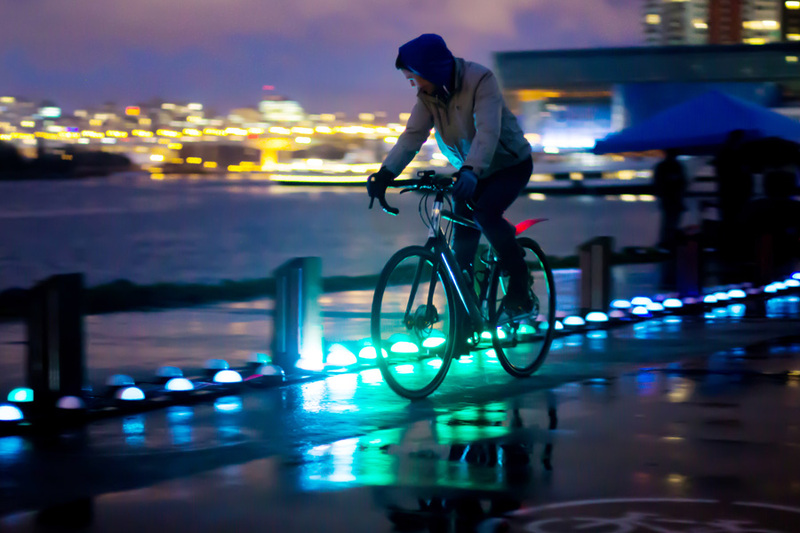 This course was part of CityStudio’s Campus Course Network, and we were partnered with the City of Vancouver Northeast False Creek planning project. We wish to thank Jeanie Morton of CityStudio, Emory Davidge of the City of Vancouver, and Rebecca Dowson of SFU Library for their invaluable assistance in creating this project. 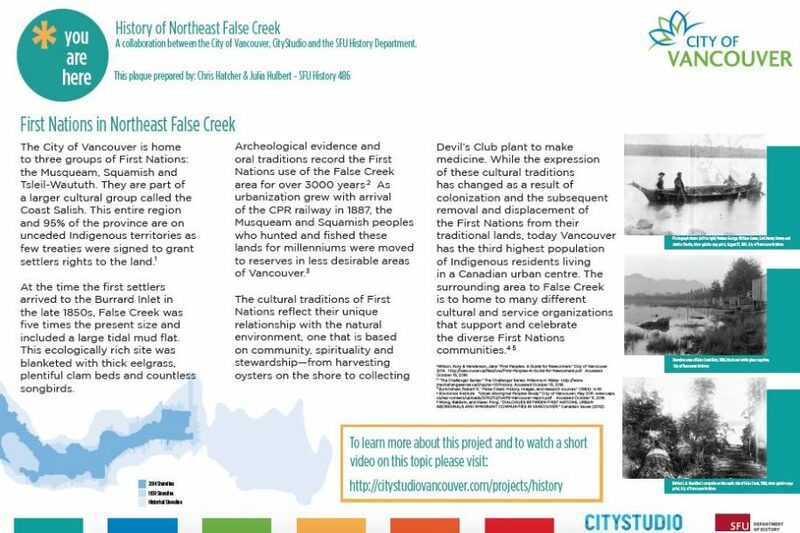 Working in pairs, the students produced a historical plaque on eight key sites located within the Northeast False Creek area. Part of Coast Salish traditional territories since time immemorial, False Creek has also played a central role in the emergence and growth of the city of Vancouver since the late nineteenth century. From the displacement of Indigenous communities and the arrival of the Canadian Pacific Railway, to the industrialization of the city and the establishment and disruption of diverse communities, to the more recent reshaping of its waterfront as a site for leisure and consumption, the areas around False Creek have been used, inhabited, celebrated, and contested in countless ways. 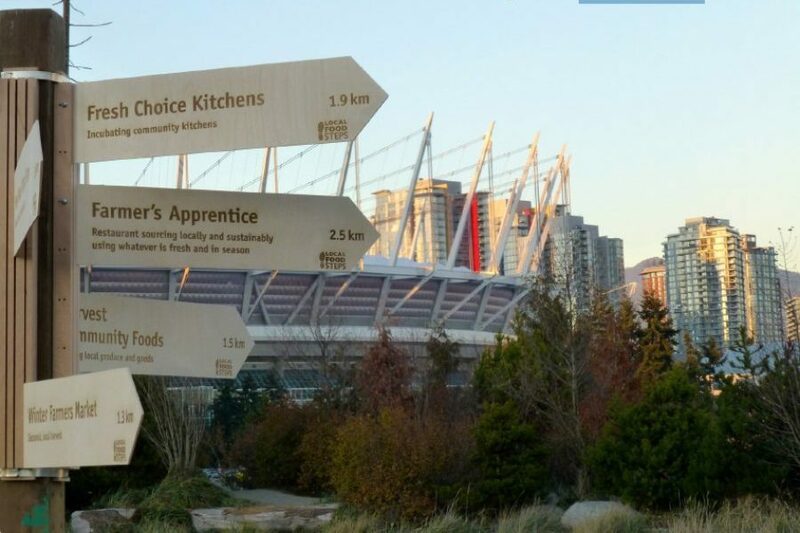 False Creek has always very much been at the centre of Vancouver’s identity. As the City of Vancouver plans for the removal of the viaducts running through North East False Creek, and its redevelopment for a variety of uses that promise a new vibrancy to the area, these plaques were designed to ensure that meaningful stories about the neighbourhood’s past figure prominently in the way it is envisaged for the future. History is present all around us, and remembering both the successes and the failures of the past is essential for building a more sustainable and inclusive community. We invite you to walk around North East False Creek, and consider the stories and images on these plaques and in these videos. We hope you’ll learn more about the city you’re visiting, or see the place you call home in a new light. The plaques are expected to be installed by the City of Vancouver in 2018.